A small ultrasonic vaporiser with 1 hour, 2 hour and 4 hour timer settings. 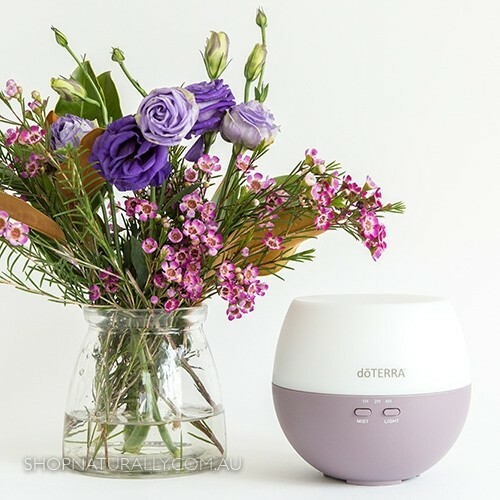 The doTERRA Petal Diffuser is a small, easy to use ultrasonic vaporiser using cold water and vibration to create a mist, not heat. The diffuser features a light which can be turned or left off during use and a 1 hour, 2 hour and 4 hour timer feature so the diffuser will automatically shut off at the end of the time period. The mist comes from the center of the white section and shoots upwards. Available in 1 colour only as pictured. As an authorised doTERRA Australia online stockist, we carry the majority of their essential oils available in Australia in our own warehouse ready to ship quickly with the rest of your natural products. A range of wholesale kits and packs are also available with significant savings, giving you 25% off the price of your future oils. A great product there is no heating up the water so it gets immediately into action. Practical and works extremely well. Its easy to move around from room to room. I am so happy with this product. Thanks Shop Naturally. It was such an easy process to order and have the doTerra Petal diffuser delivered to the door. I think it was 3 days for the whole process. The diffuser is fabulous. It took us a while to get used to the fact that it does not generate any heat. The mist we can see is not steam and therefore is so child friendly. Also love the timer enabling us to choose between three timeframes, before the diffuser switches itself off. <EOL>I would also like to thank Shop Naturally for their insight into the amazing resource Mum's are by employing mums between school hours. We need more employers like this. Love, love, love our new diffuser and use it daily without fail. For such a small diffuser it pushed out a lot of fragrance and uses minimal water. The timer setting works perfectly and the light is a lovely subtle night light. I'm using the EasyAir blend and it's great for stuffy noses and super refreshing. Highly recommend.